The United Nations Charter was ratified by its founding members on October 24, 1945. 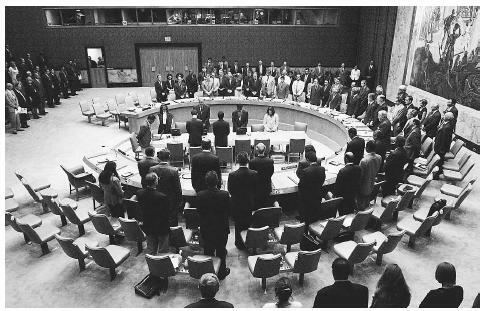 Three years later, the member nations convened the first official meeting of the Security Council, as well as the other UN committees. The outstanding mission of the entire United Nations organization is to promote global peace and good relations among nations. The Security Council fulfills the UN mission through diplomacy, sanctions, and peacekeeping operations. Membership, organization, and voting. The United Nations is divided into one large meeting body, the General Assembly, and three smaller operational committees. Every member nation, as well as observer missions, is represented in the General Assembly, and on two committees, the Economic and Social Council and the Trusteeship Council. Membership in the third and most powerful UN committee, the Security Council, is selected by established protocol. Five nations, reflecting the global balance of power when the United Nations was created, have permanent membership on the Security Council: the United States, Britain, France, Russia, and China. The ten other seats on the Security Council are filled by UN member states on a rotating basis, for two terms. The presidency of the Security Council changes every month, rotating according to the English alphabetical listing of represented countries. The Security Council itself is divided into two standing committees, the Committee of Experts on Rules of Procedure and the Committee on the Admission of New Members. The council contains several ad hoc committees, which are created to draft resolutions, investigate issues, and mediate conflicts. Working groups are often formed to conduct preliminary, investigative research on a resolution, or to facilitate the evolution of policy regarding a long-standing crisis. In the UN General Assembly, each member state has one vote. The same applies to voting on resolutions within the Security Council. Passage of a resolution requires either a simple majority or a two-thirds majority, depending on the rule of parliamentary procedure under which the vote was called. However, the permanent members of the Security Council reserve special voting rights. Permanent members reserve the right of veto, or the ability to strike down resolutions with their singular vote. Under the rules of the UN charter, the Security Council must meet at least once every year. However, the Security Council is designed to operate continuously. The non-permanent seats have staggered terms, so that the council changes five members every year, instead of ten members every two years. One member of each national delegation to the Security Council must be present at the United Nations at all times so the council can meet on a moments notice. On the few occasions that the council has met at a location other than the United Nations, Security Council member states observed this rule by leaving a member of their delegation at headquarters. negotiate a settlement between the disputing parties. The council may use its own member delegations, refer the issue to discussion in the General Assembly, or appoint the Secretary-General, the head of the United Nations, to act as mediator. If no peaceful agreement can be reached, and the disputing factions use violence, intimidation, or force, the Security Council can then enact policy resolutions to solve the conflict or restore peace. Sometimes this policy includes economic sanctions, such as trade embargoes or prohibitions on governments borrowing from international funds. Under the Security Council regulations, however, humanitarian aid can never be withheld from any nation or group of people. In the past, the United Nations has applied sanctions to nations in violation of non-proliferation of weapons agreements, or whose governments perpetuated human rights crimes. The Security Council also reserves the right to recommend expulsion of any UN member state in gross violation of the UN charter and international law, though the dismissal must be voted on and passed in the General Assembly. The Security Council is the only United Nations organization that can authorize military action and maintain a military-trained peacekeeping force. In violent international dispute, the Security Council can send intervening peacekeeping troops to secure areas in turmoil. Peacekeeping forces are supplied by various individual UN member states but under the direction of UN command. Peacekeeping forces do not participate in the military agenda of any specific member state, and are neutral in all disputes. The role of peacekeeping troops in the international community is to preserve order, to protect civilian infrastructure and safety, and guard the delivery of humanitarian aid to better facilitate the diplomatic resolution of conflicts. The Security Council is further responsible for overseeing compliance with international agreements involving weapons, the rules of engagement (conduct during war), the illegal spread of nuclear technology, and other threats to international peace. To enforce these treaties, such as international agreements on nuclear non-proliferation, the Security Council can authorize UN-led inspections of a nation's military arsenal. In addition, the Security Council can order sanctions or authorize military action. Impact on the international community. Actions taken by the United Nations Security Council have had a significant impact on the international community, with varying success. Long-standing sanctions against South Africa helped end the nation's practice of apartheid and rehabilitated its standing in the international community. On the other hand, resolutions and UN mandates regarding the Palestinian-Israeli conflict have been frequently breached, and those enforced failed to abate violence in the region. In the past decade, the Security Council has intervened in conflicts in from Bosnia to western Africa. Though peacekeepers in most tumultuous regions have managed to help dissemination of humanitarian aid and enforce the rule of law, root diplomatic solutions have lagged behind. In 2002 and 2003, the UN Security Council was at loggerheads over the question of Iraq. Although the entire Assembly voted in favor of weapons inspections in the nation, the issue of subsequent military intervention was contentious. The United States and Great Britain, as well as other UN member nations, opted to invade Iraq to overthrow the regime of Saddam Hussein without the express consent of a new, specific Security Council resolution, but with the implied consent of previous Resolution 1441. However, United Nations organizations have continued to provide humanitarian aid to the region. In early 2003, the Security Council supervised fifteen ongoing peacekeeping missions and considered resolutions seeking to implement more. In its almost sixty-year tenure, the Security Council has authorized 55 separate peacekeeping operations. Holding to the principles of the UN charter, many nations participate in ongoing peacekeeping efforts. United Nations. < http://www.un.org > (1 April 2003). United Nations. Sources: Basic Facts about the United Nations. Sales No.E.98.I.20., Press Release GA/9784, 2000.